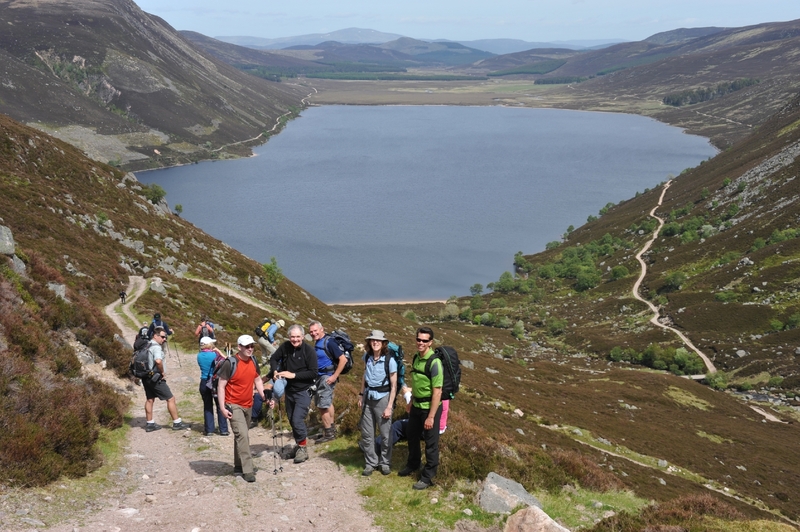 Walkers enjoy the Angus Glens Walking Festival in 2014. Seasoned hillwalkers’ and lazy Sunday strollers have been urged to get their hiking boots on this summer and take part in the Angus Glens Walking Festival. ANGUSalive’s Angus Glens Walking Festival, sponsored by the Forestry Commission Scotland, takes place from Thursday June 1 to Sunday June 4, with walks designed to show off the very best of the county’s scenery. Celebrating its 15th anniversary, the walking festival’s 20-strong walk programme stretches through and beyond the county’s five glens. Local mountain leaders and ANGUSalive’s countryside adventure rangers will lead the way offering expert insight into the landscape and its rich history. Over half of tickets available have been snapped up, with two of the most popular routes — Friday and Saturday’s Jock’s Road (Braemar to Glen Doll) and Backwater to Glen Doll, via the Kilbo Path on the Friday — already sold out. In addition to the sell-out tours, spaces on other walks are going fast including the eight new walks, which have been specially created for this year’s event; Jock’s Road (Glen Doll to Braemar); The Coastal Crawl (Lunan Bay to Arbroath Harbour, via Seaton Cliffs); The Four Munro Challenge at Glen Shee; Loch Shandra, Auchintaple Loch, Glen Isla; The Munro for Beginners Family Walk (children must be eight and over); Clachnaben, Mount Battock, Wester Cairn to Millden; The Three Glens Walk; and The Minister’s Path. The walk lengths vary in time from approximately five to eight hours long and range from moderate to extremely strenuous. ANGUSalive Chief Executive Kirsty Hunter said: “I’m really looking forward to donning my hiking boots and getting outdoors to enjoy one of the new walks launched as part of the innovative programme for 2017. “It’s fantastic to celebrate the 15th anniversary of the festival by offering local residents and visitors something different to enjoy when they join us for the guided walks as individuals, families or groups of friends. There is also a talk from local historian David Orr to share tales of local Drove Roads, cattle herding routes, with Jocks Roads being one of them. The talk will be hosted at ANGUSalive’s Gateway to the Glens museum on the first evening of the festival at 7.30pm with booking online at www.angusalive.scot/tickets. For more information and to book a place on one of the walks, go to www.angusglenswalkingfestival.com, or call the box office for booking assistance on 01241 435800. or email info@angusglenswalkingfestival.com.